The readily available and competitive package of the Cosworth DFV V8 and Hewland gearbox made entering Formula 1 during the 1970s relatively straightforward. Among the new teams that joined was the British-based, American Shadow. The Don Nichols-owned operation had previously run exclusively in Can-Am but branched out to Grand Prix racing in 1973 with the Tony Southgate designed Shadow DN1. Running the same drivetrain as almost the entire field however meant it was nearly impossible to get an edge, especially for a relatively small team like Shadow. This prompted Nichols to look around for a different engine supplier that would give his team a leg up on the competition. 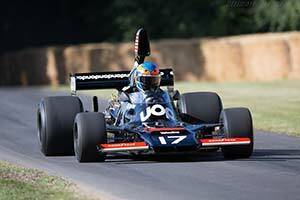 In 1975, he found a somewhat unlikely one in the form of the French company Matra, whose only real success had come using the Cosworth DFV and not their own V12 that Nichols was intending to run. The Matra V12 had last been used in F1 during the 1972 season, at the end of which the French withdrew from Grand Prix racing. This was, however, far from the end of the line for the glorious V12 as powering Matra sports cars, it would go on to win the 24 Hours of Le Mans three consecutive times between 1972 and 1974. It was an evolution of the endurance racing engine that Matra intended to supply to Shadow for the 1975 season. As the engine did not have to run for 24 hours or as efficiently as possible, the Matra engines redesigned to V12 to suit the particular needs of Grand Prix racing. As a result, the twin-cam, four-valve per cylinder engine was not quite as durable or frugal as the Le Mans unit but did produce around 500 bhp. That meant it was slightly more powerful than the DFV engine but being a V12, it was also slightly longer and heavier than the Cosworth DFV.